The is truly a case of the“BEST GETTING BETTER”. 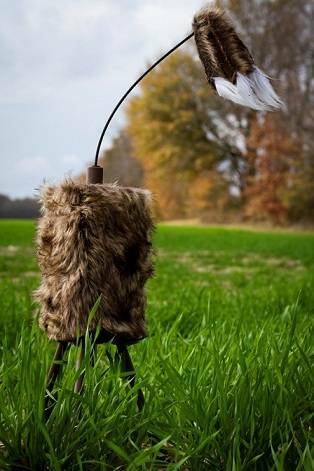 The Mojo Critter proved to be the most effective and the most popular predator decoy EVER, and revolutionized the use of decoys in predator hunting. NOW, MOJO introduces the MOJO SUPER CRITTER using the same tantalizing motion but in a more advanced decoy. Includes magnetically connected CRITTER topper, built-in disappearing tri-pod legs plus MOJO Peg w/1/4” camera thread gives multiple mounting options; super tough ABS housing; provided with MOJO Cottontail sound, 3-way switch that allows motion only, or motion PLUS sound. Decoy is specially designed to allow on/off control from most remote callers that have 3.5mm auxiliary port (requires common 3.5mm double male chord available as accessory). Operates up to 20 hours on 4 AA batteries (not included). Convenient wireless removable battery holder stores in recess with easily removable cover. Realistic removable fur cover. It really is the “BEST of the BEST”! The MOJO Super Critter is proven to work on all predators and will greatly improve your success. Add the MOJO Hawk #HW4310 with this MOJO Critter to have the complete MOJO Predator System.